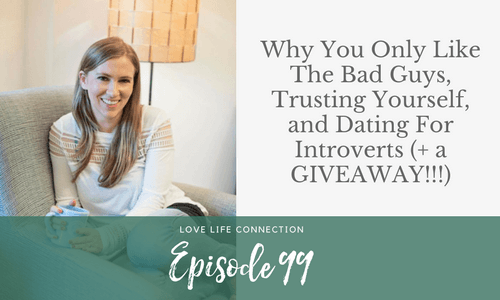 In celebration of my 100th episode on the Love Life Connection podcast, I’m hosting a giveaway! I’m announcing the winner THIS Thursday (12/14) at 10am MST when the 100th episode goes live. It can take up to 24 hours for your review to show up, so please post your review by Wednesday, December 13th at 10am MST. I can’t wait to see your reviews, and THANK YOU! How do you deal with doubt and insecurity about decisions you have made to be the right one? Why do I only like the bad guys? Do I have to settling on a boring one? Do you have times for online dating as an introvert? Enter the giveaway! Leave a review on my podcast to win a 2018 Danielle LaPorte Planner or a 45-minute coaching session with Veronica. More details HERE.